The Japanese web corpus (jpWaC) is a Japanese corpus made up of texts collected from the Internet. The corpus was prepared by Tomaž Erjavec using a list of URLs provided by Serge Sharoff at the University of Leeds. The standards of corpus preparation are described in the document A Corpus Factory for Many Languages (Kilgarriff et al. at LREC 2010). The corpus was segmented, part-of-speech tagged and lemmatised using Chasen, an open-source toolset for Japanese. Word sketches were prepared by Irena Srdanovic. The Japanese WaC corpus has the following part-of-speech tagset legend. BARONI, Marco, et al. The WaCky wide web: a collection of very large linguistically processed web-crawledcorpora. Language resources and evaluation, 2009, 43.3: 209-226. Kilgarriff, A., Reddy, S., Pomikálek, J., & Avinesh, P. V. S. (2010, May). A corpus factory for many languages. In LREC. Srdanović, I., Naomi, I. D. A., Bučar, C. S., Kilgarriff, A., & Kovář, V. (2011). Japanese Word Sketches: Advances and Problems. Acta Linguistica Asiatica, 1(2), 63-82. 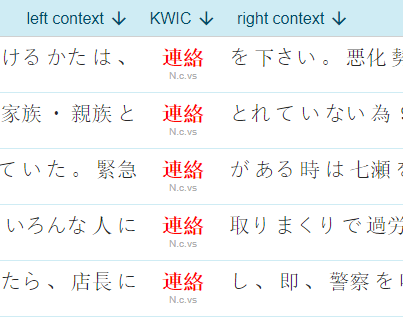 Sketch Engine offers a range of tools to work with this Japanese corpus from the web.